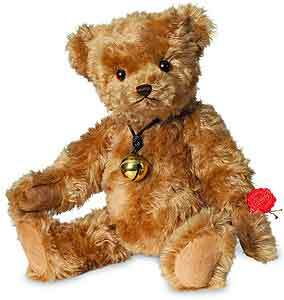 Teddy Hermann Eckhardt Teddy Bear, fully jointed and made of the finest gold and blond Mohair and he wears a brass bell. This beautiful bear is a limited edition of only 200 pieces worldwide. Amber and black safety eyes. stuffed by hand with Wood Wool. Material mohair is surface washable only. With Growler. Size 46cm tall.